Inner thread M42 x 0,75. T-2 Dustcap. The new aluminium Baader T2 adjustment rings are the perfect solution to achieving that ideal spacing when using field flatteners or focal reducers. Well suited to tune the rotary position of all kinds of T-2 accessories in approx 90° increments, to move locking screws of eyepiece holders into a comfortable position. 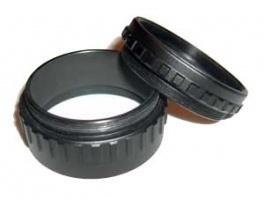 Nicely made extension tubes suitable for use with a wide variety of T-threaded equipment. Available in 7.5mm, 15mm & 40mm lenghts. As spacers they are useful for increasing image scale and magnification. M36.4 is standard of Vixen telescopes. Telescope side external thread 36.4mm. Focuser side T-2 external thread (direct T-2 photo thread for Vixen, NexStar 4, Meade etc...).